Terraformer is a geometry toolkit for working with different geometry formats and building geo databases. Pushlet is a simple API for sending notifications through the Apple and Google push notification services. It works well with Terraformer for converting data between different geo formats, and geoservices-js for making advanced requests to ArcGIS REST services such as place finding and reverse geocoding. If you're familiar with Leaflet, you'll feel right at home using this library. All of the Leaflet conventions are followed, so you can use ArcGIS services in a familiar style. One of the major benefits of using Esri-Leaflet over accessing the ArcGIS map tiles directly is this library handles displaying the correct attributions depending on the visible map area. Esri-Leaflet also has support for displaying retina basemaps! Below is an example of displaying a tiled ArcGIS map service over the gray basemap in an Esri Leaflet map. It's as simple as this code snippet! Of course we're not limited to displaying just points or polygons, lines work too! 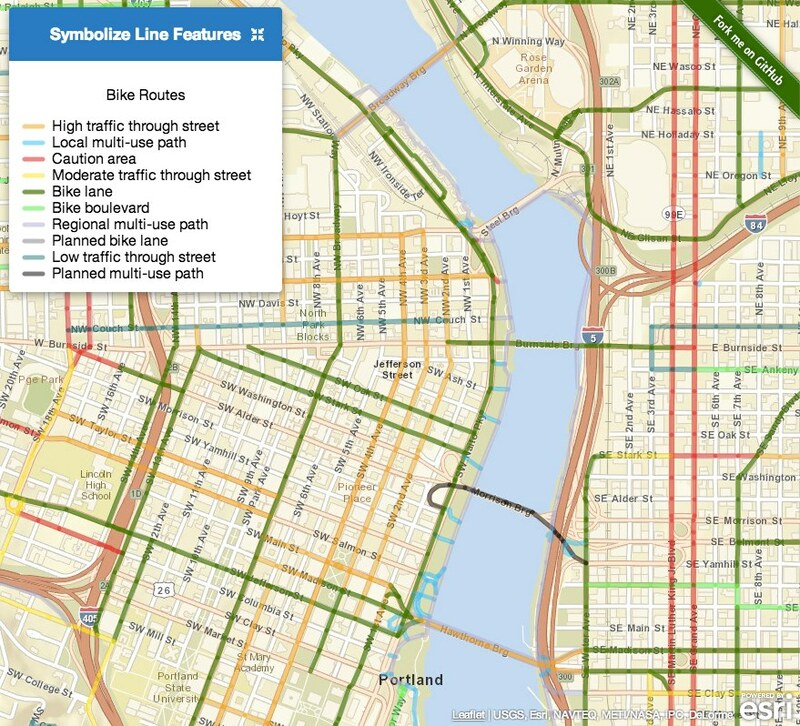 Here is a map showing bike routes in Portland. +(geojson.properties.PREFIX ? geojson.properties.PREFIX : "")+" "
+(geojson.properties.STREETNAME ? 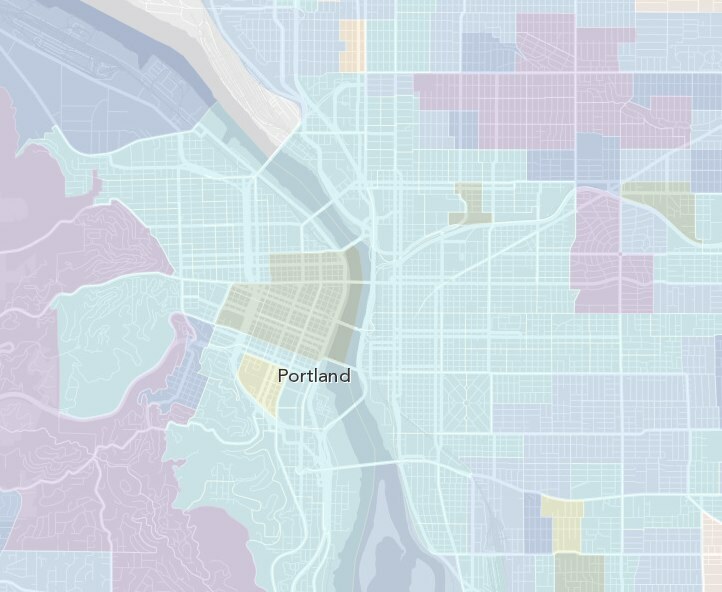 geojson.properties.STREETNAME : "")+" "
Check out more demos on the Esri-Leaflet Github page! Currently it can be used to consuming free services, and you can also use it to authenticate and consume paid services. For now, it supports geocoding and feature services, and will soon support the directions and routing services and eventually the geometry service. 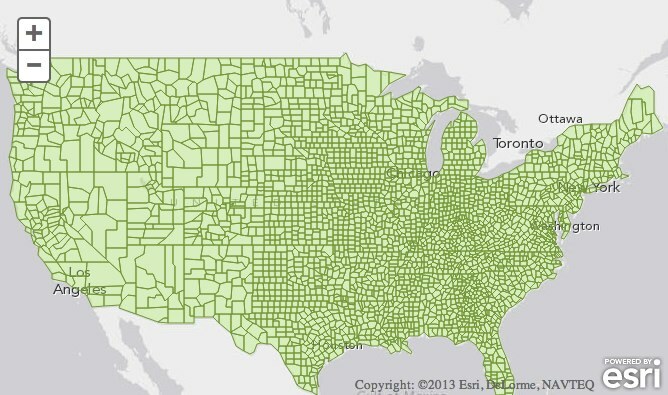 For example, Terraformer can load in a file of all the US counties, build an R-Tree index, and can then quickly query which county a given latitude/longitude is within. If you've ever had the pleasure of working directly with the Apple APNS API, you know how difficult it can be to get it right. To connect to APNS, you have to configure SSL certificates to authenticate, and then it requires maintaining a persistent socket connection to the servers rather than making a new connection for each push notification. Pushlet is a stateless wrapper around the API designed to make it easier to use, like you'd use a typical HTTP API. Pushlet uses Redis as a temporary data store to store certificates, and maintains the socket connections to the APNS service so you don't have to worry about it. alert: "The quick brown fox jumps over the lazy dog"
Then you just re-send the message including the push certificate. "alert": "The quick brown fox jumps over the lazy dog"
after Pushlet successfully connects to APNS and delivers the message, it will wait for a specified time to see if the socket is closed (Apple's way of indicating an error condition) and if the socket remains open, responds with "ok". Of course once you're certain your certificates are configured properly and have successfully sent push notifications to your devices, you can disable the timeout and speed up the HTTP response. Since Pushlet does not store device tokens, and is not the primary store of push certificates, you can easily run multiple instances of Pushlet on a cluster of machines to increase throughput.